We’re happy to announce our very own Ping.sg Facebook application, just because every “Web 2.0” site ought to have one. Okay, we’re kidding, it’s actually useful. With the app, not only will it show your Ping.sg’s username and avatar on your sidebar, it would also automatically announce your latest blog posts to onto your mini feed and to your friends’ news feeds, so that they would be informed of your latest posts. If you’re on Facebook, follow this link to install the Ping.sg Facebook app. If you have any suggestions on how we could potentially improve our app further, feel free to leave a comment here. By the way, before we forget, do join the Ping.sg group on Facebook. And if you happen to still own a Friendster account since your secondary school days, join the Ping.sg Group on Friendster as well. Ping.sg army, get ready to invade the social networks! Waaaaaaaarrrrghhhhhhhhhh! This is an event to bring together all of those interested in the future of gaming, virtual worlds, Creative Commons, and global free culture. Enjoy the 3-Ds of this party: drinking, dancing, and discussing! Log in at 9:30pm for the free/open (source) bar! 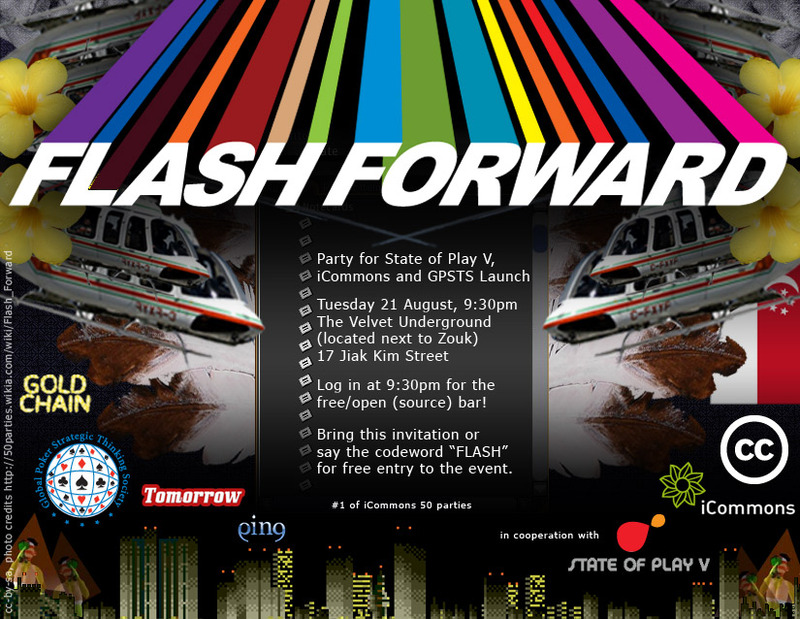 Bring this invitation or say the codeword “FLASH” for free entry to the event. Ping.sg supports Creative Commons and is happy to be supporting the above event. If you would like to meet some people related to Creative Commons community, future of gaming, or just want to have a good time dancing to good music with free booze, feel free to join us at the party. On top of that, during the event, there will also be Creative Commons-license electronic music performance and live DJ by editors of Gratisvibes, a project also started by Ping.sg’s founder. There, another reason you should attend the party. As usual, just for Ping.sg’s members, do RSVP in the forum if you’re attending.